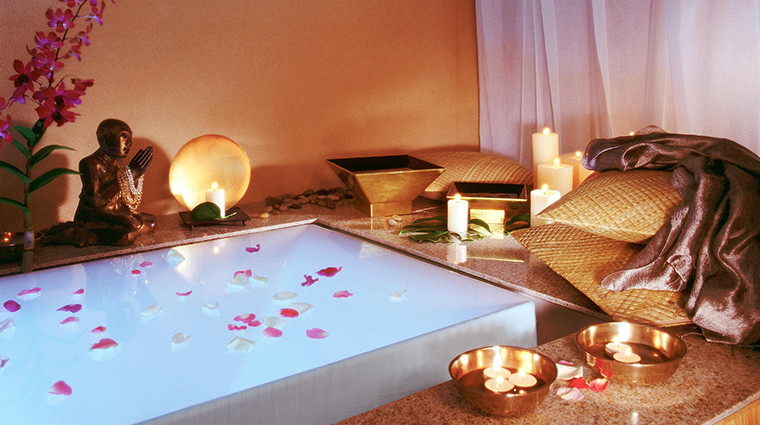 The Kahala Spa is all about relaxation and rejuvenation with a sense of place. Every treatment, from the warm pōhaku (stone) massage to the spa’s signature facial, combines luxurious Hawaii-made products and traditional techniques in a tranquil and tropical setting. The private treatment suites are tucked away on the backside of the secluded Kahala Hotel and Resort, a gorgeous Forbes Travel Guide Four-Star beachfront property in Honolulu. Named for different Hawaiian flowers, each of the 550-square-foot spa suites is decorated in an authentic island style with wooden floors and local quilts adorning the treatment beds. The spa offers a wide range of services, from Hawaiian-style lomilomi massages to oxygen facials to classic manicures. 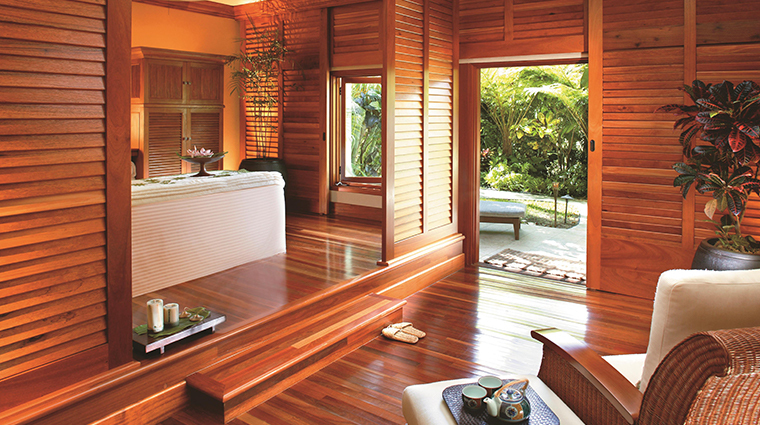 Treatments begin with a welcoming foot ritual that uses Hawaiian sea salts and aromatic water to ease you into bliss. The Four-Star Spa boasts nine spacious treatment rooms, converted from hotel suites. Be sure to take advantage of the privacy with a dip in your deep-soaking tub. Each treatment begins with the ritual of ho'omaka (which means “to begin”) that includes a relaxing foot massage using 'alaea (unrefined sea salt that’s been mixed with red volcanic clay) and locally made body sugar scrubs from Hawaiian Body Products. Choose between frangrant passion fruit or an earthy rainforest scent. The scent on the cool towels that are placed over your eyes during the service is from the kinehe, an indigenous plant used by native Hawaiians to stimulate the immune system. There are more than massages and facials at this Oahu spa; book an hour-long sun recovery treatment, smoothing cellulite therapy, waxing, sugaring, nail services and even a non-toxic spray tan. Guys can indulge in a luxurious straightedge shave, complete in a traditional barber’s chair. Plan to spend extra time here after your treatment. There’s a relaxing outdoor area just outside the treatment rooms with lounge chairs and a hypnotizing view of swaying palm trees. If you prefer your massage in your guest room or — better yet — outdoors, you can ask for a location change for $50 more. Don’t have time to visit the spa? Book an in-room bath treatment instead. There’s a soak for everyone, whether you need to remedy dry skin, relieve aching muscles, spark romance or just get the kids excited about bath time with bubble gum-, chocolate- or grape-scented suds. Ask your therapist about any of the products you liked during your treatment. They’re all available for purchase either at the hotel or online. The Honolulu spa suggests booking services at least 48 hours in advance. As a guest of the hotel, you’ll get priority over other visitors. The Lovely Hula Hands is one of the spa’s top treatments. It’s a four-handed massage where two therapists use movements from hula and lomilomi along with warm pōhaku (stones) to relieve stress and tension. Couples can splurge on the Ho‘oipaipo (Romance) package. This three-and-a-half-hour treatment features the spa’s signature foot massage, full-body scrubs, a 90-minute massage for two and facials — all with Hawaiian music wafting in the romatically lit suite. After a day of running (the Honolulu Marathon route skirts the hotel property), surfing or golfing at the nearby Wai‘alae Country Club, feel restored with the spa’s Athletic Rebound treatment, which uses pressure, reflex-zone therapy, aromatherapy and a series of muscle strethes to invigorate your body. If you’ve just landed in Honolulu after hours sitting in a cramped airplane, consider the two-hour Jetsetter’s Rejuvenation, which includes an effervescent body soak using Hawaiian botanicals, a full-body massage and a facial or scalp-and-foot massage. The Kahala Spa offers nine private treatment rooms complete with a glass-enclosed shower and deep-soak tub. The room is always kept at a comfortable 74 degrees Fahrenheit, unless you request otherwise. The dark wood in the treatment rooms evoke a soothing, intimate atomsphere. There’s a sitting area where you can relax before or after your treatment. Each room is outfitted with products by Hawaiian Rainforest Naturals, a family-run company located at the edge of a native ʻōhiʻa lehua rainforest on the Big Island of Hawaii. The company specializes in fresh flower essences that contain therapeutic benefits to help to soothe and balance emotions.